Here are authors of different ages and cultures, many of them mothers and grandmothers themselves, each writing in her own distinctive voice, sharing her secret sorrows, joys, hurt, anger, and understanding. "What do I tell her? What do I not tell her? What do I wish I had said?" Their thoughtful, provocative, funny, and sometimes painful letters hold revelations -- memories and confessions, poems and tales -- at once personal and universal, touching and profound. When their heartfelt words begin, however, you will forget their fame and discover the bare-bones truth of what they have written. Sometimes the letters have taken the form of poems, as in poet Maxine Kumin's crown of sonnets or Susan Kelly-DeWitt's waves of haiku or Enid Shomer's sestina. The various forms do not change the demands of the epistolary voice: directness, intimacy and most of all, honesty. Indeed, literary forms allow us to reach into the fire of this emotional furnace wearing the "asbestos glove" Adrienne Rich so aptly compared to art's varied disguises. As they say in the Oldsmobile ads, "This is not your father's Oldsmobile." Well, as the editor of this collection, I say this is not your mother's anthology, either. The voices you hear are daughters' voices. But through the daughters speaking in this collection, you will hear their mothers' voices clearly. This is also not your typical anthology. Maybe because the theme is family, the process of editing the book became a very personal experience for me. Perhaps writing our letters together during an eighteen-month period -- between February 1995 and August 1996 -- produced a collective energy that changed us all. Whatever the magic, I find there is really only one way to talk about being the contibuting editor of this anthology, and that is to say that the book, its journey, and the writers who contributed to it have become a transformative part of my life. The project began, as so many life-changing events have begun for me, with a phone call. On October 25, 1994, my literary agent and her associate had been brainstorming new book projects and had come up with an idea for an anthology. How would I like to edit and contribute to a collection of original letters written by contemporary women authors to their mothers? "Not an archival project?" I asked, the novelist in me skeptical of getting buried in a research project. No, they assured me. More a revisiting of a never-completed emotional cycle. I was hooked. I thought immediately of the disappointing sentiments expressed in Mother's Day cards. So often the verses begin, I know I don't tell you very often...and then go on to express less than we want to say, not as well as we want to say it, but we buy the cards anyway. We find the cards stored in drawers and boxes at our mothers' homes, and, as we have our own children, our own collections begin to accumulate. Maybe this book could be a different Mother's Day greeting, I thought. Maybe this book could get things said that usually remain unspoken. Before I had even hung up the phone, I had suggested the title that has stayed: I've Always Meant to Tell You. Then came the telling. At the time of that phone call, my mother was in relatively good health and living with her second husband in New Mexico. Since then, she has suffered vertebra fractures due to osteoporosis, moved to California, divorced her second husband, and now resides in an assisted-care center, events I was called upon, as her daughter and only child, to help her manage. I really don't know what the past two years would have looked like without the community of women that formed as this book came to life. I can only say that as the writers began calling and the letters began arriving, I was definitely not alone. All the paradoxes of frustration and love, sorrow and joy, abuse and caring, self-doubt and empowerment, illness and health, and other issues that I had carried around as elements in my relationship with my mother were turning up in the letters of other writers to their mothers. Carol Bly remembers her mother's valiant struggle with and eventual death from tuberculosis in the 1930s and 1940s, but she also continues the ongoing argument about social class that she carried on with her mother long after the mother's death. • Carolyn See's letter is a truth-telling benediction for anyone who has grown up in the presence of a rageful adult. • A letter/poem by Enid Shomer confronts her mother's passivity in the face of her father's abuses. • Joyce Carol Oates offers her mother a loving tribute and, with it, an elegiac remembrance of farm life. • Cartoonist and humorist Nicole Hollander offers us a circular series of communiques to her character's mother in the form of daily phone conversations. • Suzanne Lipsett, who has no actual memories of her mother, addresses that phantom presence in a moving, deceptively lighthearted voice. • Mary Zeppa composes a compelling confession about the haunting secrets of abortion. • Joanne Meschery offers a complex portrait of her mother's life as a minister's wife in mid-20th century America. Eighty voices blending. The cumulative effect, breathtaking. Hilma Wolitzer called at midnight, New York time, the night of the deadline to say she was so sad she didn't think she could write this letter. Then, months after I had received her letter, she called again, saying her mother had died. • Pam Houston called from Kansas the week after the deadline saying she hadn't forgotten but she'd been putting it off "an awful lot." • Laura Kasischke wrote from Las Vegas to say she was happily pregnant and in the midst of moving back to Michigan, but she had the letter written. • Rita Dove had to delay her letter because of a badly hurt wrist. 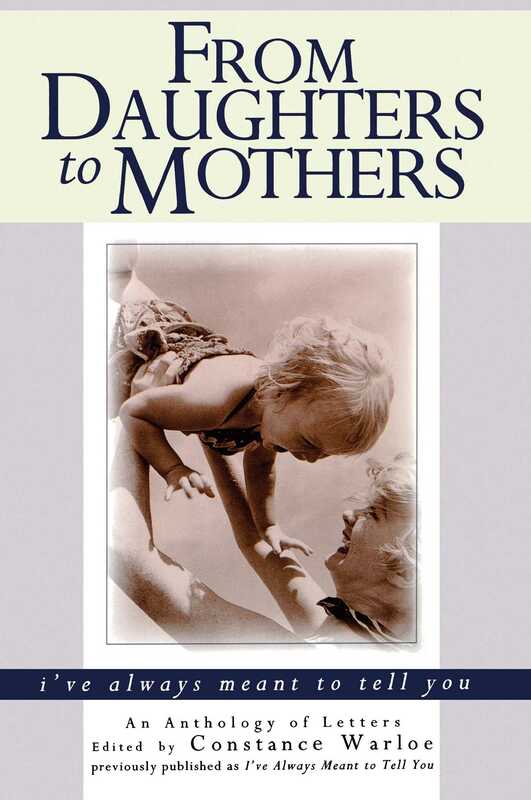 • Five babies were born to the writers during the year and a half of this project -- Ann Hood, Laura Kasischke, Barbara Kingsolver, Dawn Raffel and Susan Straight all gave birth. • Lucile Adler, a poet who is usually very concise, ended up writing a long prose collage of letters, a tribute to her mother's great courage and love of life. • Sonia Gernes, whose father had just died and she herself had just been diagnosed with cancer, somehow got her letter in on time. • Natalie Goldberg, the most famous of writing coaches, called me one afternoon to say she could not write the letter and would have to withdraw from the anthology. I said if it wasn't meant to be, it wasn't meant to be, and accepted her withdrawal. She called three hours later and said she had written the letter, she just needed to know she didn't have to! • Rosellen Brown, whose mother was still living at the time she wrote the piece, got word while at a conference in Italy that her mother had died; she decided that for her reading that night in Spoleto she had to read her "A Natural Gift." Without any printers available, she read it from the glowing screen of her laptop computer in an amphitheater looking down over a hillside to an ancient monastery. She wrote later to thank me for the catharsis of having to produce a letter she otherwise would never have written. • Finally, hardest of all to report, Suzanne Lipsett, who was among the first to turn in her letter, died before the book became a reality. She died in California, during the golden month of September 1996, after a long and absolutely valiant struggle with ovarian cancer. Her letter to her mother speaks to all of us about the moment, and exactly what it means to speak. My office has been populated by a roomful of women who were saying what was on their minds and in their hearts and saying it with dignity, courage, and eloquent language. Ultimately, I've Always Meant to Tell You: Letters to Our Mothers is about finding the courage to say the unsayable, and then actually getting it said. I hope the telling here will bring courage and communication into your life and that of your family. Read on. Atlanta Journal-Constitution An outstanding gift book. Grade: A.
Press-Telegram (Long Beach, CA) A warm, eloquent look at complicated relationships and deep lessons in love. The Bloomsbury Review This is an unforgettable book, one that will leave every reader deeply touched. Cedar Rapids Gazette (IA) What a powerful book!